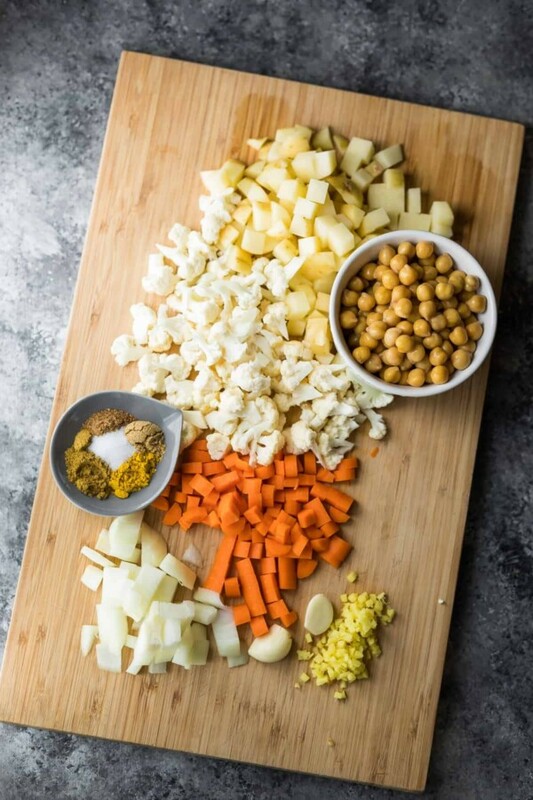 These healthy baked cauliflower chickpea samosas can be baked and stored in the freezer for an easy grab and go snack. 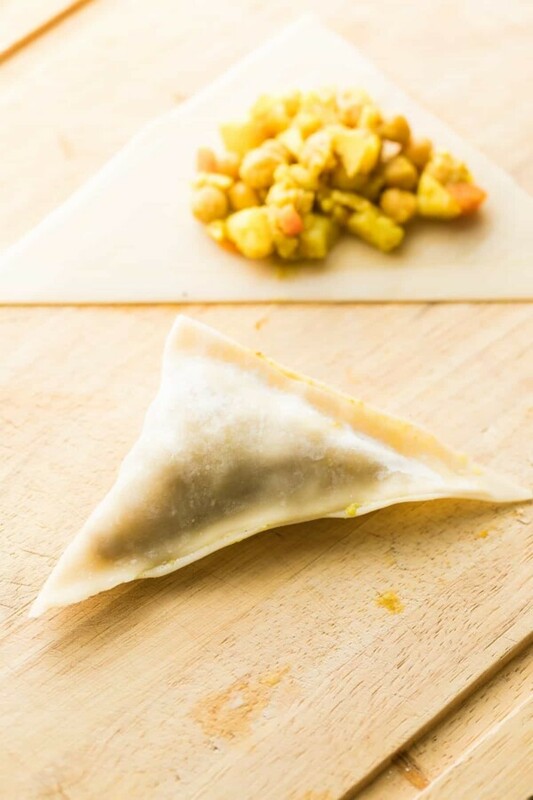 These samosas use egg roll wrappers, which cuts out a huge amount of prep work. I have some fun news to share with you: we’re having another boy! Can I be honest with you? I may have understated when I said that I was ‘hoping for a girl’. Apparently, I was really hoping for a girl, because when we found out it was a boy, I was really surprised with how sad I felt. 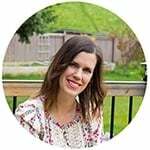 We are only having 2 kids, so it meant I had to let go of the idea of having a daughter…and I had to let go of the girl name we’d been holding in our hearts since I was pregnant with Kai. But today, something amazing happened. We found our baby boy #2 name and I am so excited…actually I feel pumped up! I am getting used to the idea that we are going to have a house with wild little boys, but finding our name for baby boy has really made me feel so excited for the adventures we are going to have together. Sorry to tease, but I won’t be sharing the name until baby boy #2 joins us. 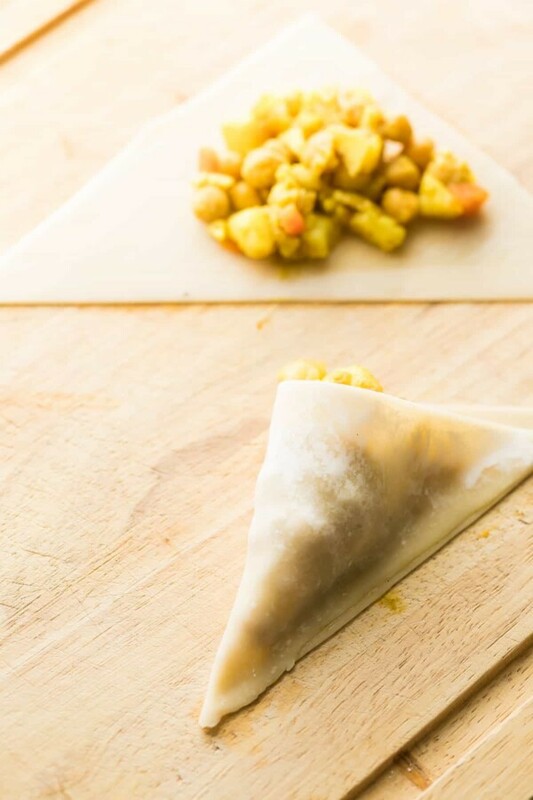 And now on to other exciting things: like these healthy baked cauliflower chickpea samosas! Now I have made my own samosas before. With the dough from scratch. And they were delicious. But they took me three whole hours of prep, between making the filling, making the dough, chilling the dough, rolling the dough out, cutting it, filling it and baking them up. …they truly are amazingly delicious! 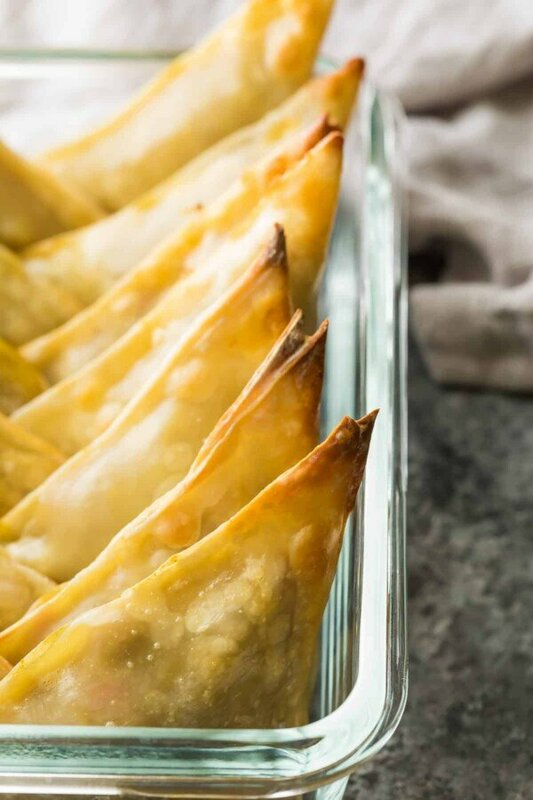 But these days, I don’t have that kind of time to spend…so I was totally intrigued by the idea of using egg roll wrappers as a samosa dough substitute. 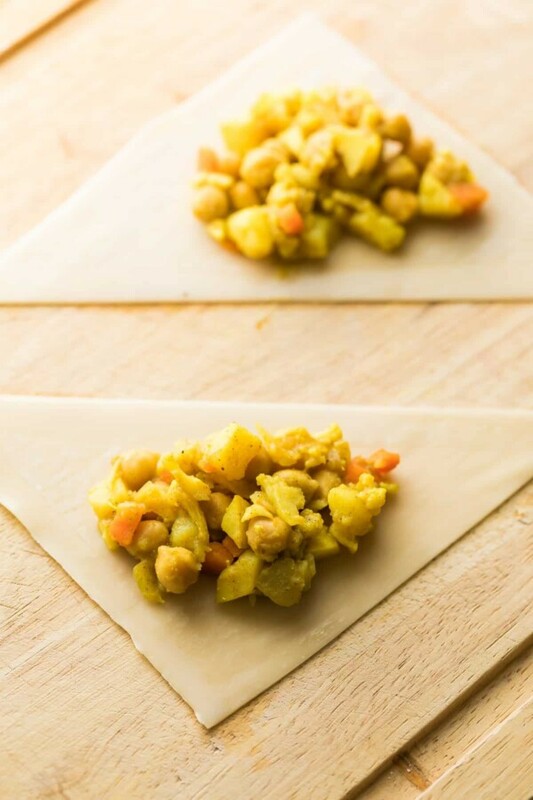 Not only are egg roll wrappers a HUGE timesaver for these healthy baked cauliflower chickpea samosas, but they also lighten things up quite a bit! These samosas come in at just 84 calories each. Not only that, but they are packed full of healthy veggies: cauliflower, carrots, onion and potatoes. I originally made them without the potatoes but found them slightly dry…adding in the potatoes helps them retain some moisture. 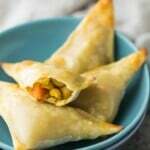 Now you are going to have to adjust your expectations slightly with these samosas, as the egg roll wrapper just isn’t as tasty as homemade samosa dough, and it’s definitely not as tasty as a deep fried samosa. BUT. If you’re looking for a healthy samosa alternative, these are perfect for you. 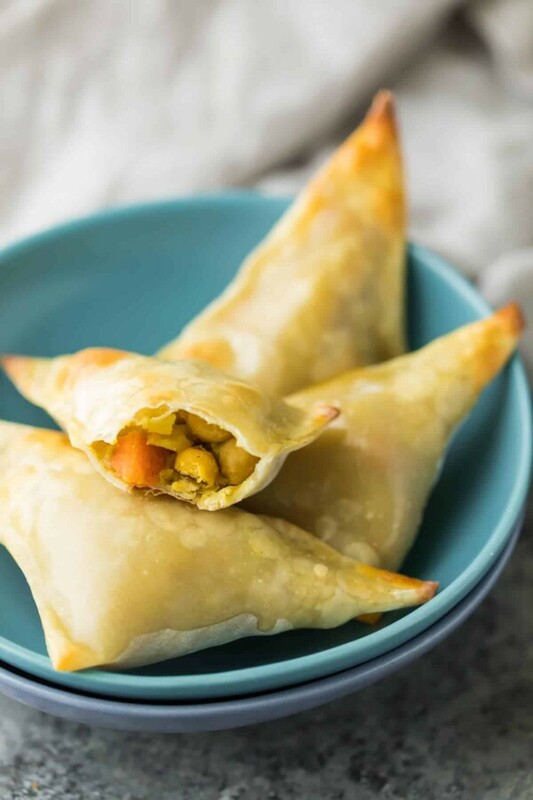 Interestingly, I actually found I enjoyed these healthy baked cauliflower chickpea samosas even more after they sat in the fridge overnight…this helps the wrappers soften up a touch. And they are also great enjoyed fresh from the freezer! Simply heat in the microwave in 30 second increments and you are on your way to a tasty 84 calorie samosa that is packed full of veggies. YUM. for the sake of simplicity, I just folded these like turnovers. If you want to learn how to fold them traditionally, check out this video! Heat olive oil over medium heat in a large pan. Add the onion, carrots and potatoes, and cook, stirring frequently for 5 minutes. Add the cauliflower florets, garlic, ginger and spices, and cook for 1-2 minutes, until fragrant. Add the stock, cover the pan, and cook for 15 minutes, until potatoes are soft. Remove lid and cook down until liquids are largely gone (5-10 more minutes), mashing the mixture as it cooks. Stir in the chickpeas and lemon juice. Allow mixture to cool slightly before folding the samosas. To BakePre-heat oven to 425°F. Line two baking sheets with parchment and set aside. Cut a 6 inch egg roll wrapper to make it perfectly square, then cut in half to make two triangles. Spoon 1-2 tablespoons of filling in the middle, then brush the edges lightly with water. Fold the triangle over on itself, pressing firmly to seal. Repeat with remaining edge, and place on prepared baking sheet. Repeat with all remaining samosas, until no filling remains. Brush samosas with beaten egg, then bake for 12-14 minutes, until slightly golden and crispy. 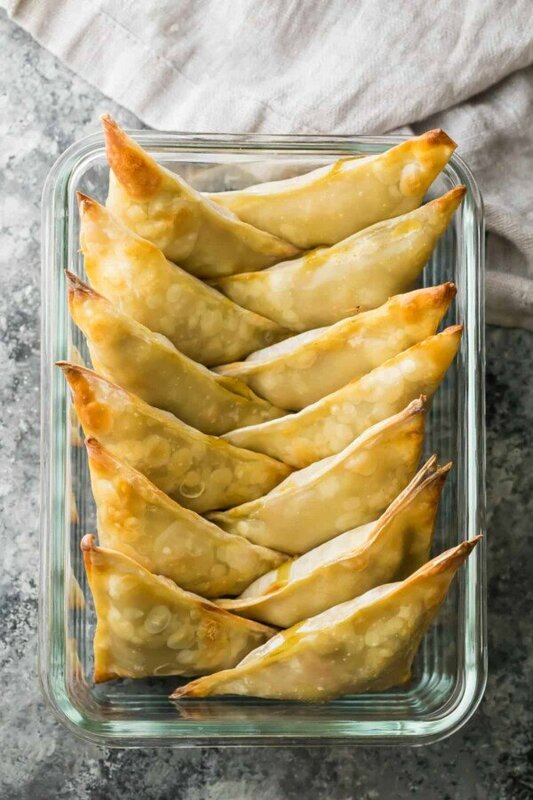 To freeze:Cool samosas completely, then place on a baking sheet and freeze for one hour before transfering to a large freezer bag. Freeze for up to 1 month. To re-heat:Microwave for 20 seconds fresh from the fridge, or multiple 30 second increments if re-heating from frozen. I tried these tonight and they turned out amazing. So glad to hear that! Thanks so much for taking the time to leave a review, Sam! Delicious Snack. Thanks for sharing the recipe. I tried this recipe today and the eggroll wrappers started to burn on the edges. I lowered the ovens temperature to 350 degrees and baked a batch and I still had the same issue. The filling is incredible but I ended up using the rest of the filling for crepes. Not sure if I’m missing something but your instructions don’t indicate when to add the chickpeas… am I adding with the cauliflower etc. ??? Thanks! Apologies, I’ve just updated the recipe! 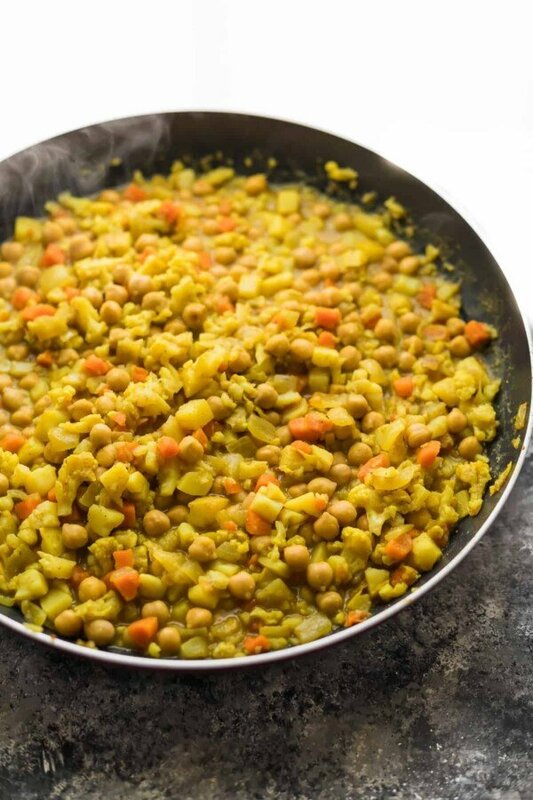 The chickpeas and lemon juice are stirred in after step 5. Making tonight and they smell great! Directions left out lemon juice and chickpeas so I guessed. I sampled the filling… Delish! Ack! Thank you I will update the recipe. I hope you enjoyed the samosas Susy! These turned out perfect! I added a little zing with siracha sauce. I also made my potato 1/2 sweet potato. I love it when a recipe actually turns out as advertised!